I've been watching the story of ASK.com progress for years now. Ever since I began using the then dubbed "ASK Jeeves" search engine in the late 90's. I like ASK. I liked the fact that they dare to be different. They still have the best Search Engine Results Page in the business... but then again that does not appear to be winning over the masses. But did you know that Google was beginning to take note? so much so that they began to follow ASK's lead (think Google Universal Search here). So if Google was taking note, you would think that others would follow. ASK just needed time and a few good people to try out their Search product. People just don't appear to be willing to give ASK a chance. For you see it appears as though everyone has written ASK off. In fact Danny Sullivan over at Search Engine Land has delivered his own obituary for ASK.com. Even those that were critical of the ASK TV commercials are in shock about IAC's move with ASK. I myself feel a need to refuse to believe that this is the end of ASK, but I'm losing hope fast. The world needs ASK. You see as much as I like Google, a Google, Yahoo, Microsoft three ring circus just doesn't sit well with me as a user of search. Frankly I'm sick of Google Ads appearing all over my results pages. When I use a search engine I am looking for information, not an ad for a "divorce lawyer", not an ad for an Apple iPhone, or for Cirque de Soleil tickets. While I may be looking for information about these things I am definitely not going to a search engine to go search online ads. Yahoo is in a state of turmoil and when it comes to search, Microsoft is a disaster. I don't know who exactly coined the phrase "going beyond 10 blue links," but I know the guy who popularized it -- Jim Lanzone. And make no mistake, Jim failed to dramatically move Ask in the way that many might have been hoping for. But he understood search. He has many friends in the industry not because he's a nice guy but because he was passionate about improving the search experience. Search is hurt by his departure, but his departure was only the harbinger that Ask itself would be leaving the stage. I still do not understand the decision to let go of Jim Lanzone. 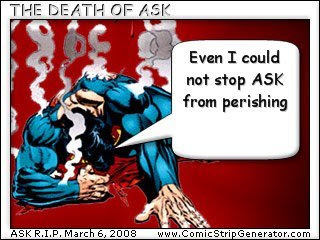 It appears that it was because ASK does not feel like being a search engine any more. The reports from this past week have been disturbing for die-hard ASK fans like myself. ASK had some cool stuff in the works. What's going to happen to those items? It's like ASK has suffered a major concussion and forgot who they were and where they were going. They are heading in a new direction. Will the Real Jeeves Please Stand Up? As I ponder IAC's decision, I feel like it is truly the end of an era. I thought that Barry Diller had more drive and passion when it came to ASK. Instead he is quitting... he's going to stop trying to compete with Google. In November, Diller annonced controversial plans to break IAC into five different companies. In January when Liberty Media chief executive John Malone, an opponent of the penta-plan, tried to get Diller bounced off IAC's board, Diller called Malone "insane" and referred to Malone's lawsuit as "hogwash" and a "sideshow." Liberty Media controls 29.9% of IAC. At 66, Diller has kissed ASK goodbye. He maybe should have waited before putting ASK out to pasture... he may have more in common with Jeeves than he thinks. Reports suggest that Barry Diller may be out as CEO of IAC as early as next week. Perhaps Safka could be soon to follow? I've said it a number of times, I think that ASK is a great search search engine with huge potential. I would hope that the powers that be reconsider their so called "strategy" with ASK. ASK while not a Google beater had potential to be a strong #3 player in the search engine world. ASK it's been fun. Even as there is but a flicker of hope that you'll continue to compete as a true search engine, I'll visit your search results (grave) often. Godspeed.